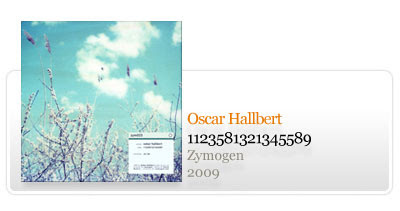 Oskar Hallbert is a musician who lives in a house in the woods in the north Sweden. The EP "Sids apartment" on Rainmusic has been one of Zymogen's favourite album of 2008 and we luckily got in touch with him to plan the re-release of "1123581321345589". Previously released in 50 copies on a small american CD-r label. "I'm interested in numbers, and I'm interested in failuers. Fibonacci tried to make a number sequence that would show how a population of rabbits grew. Turns out his number sequence is worhless if you try to show how a rabbit population grows - BUT he unwillingly discovered something far more interesting. Turns out that the Fibonacci numbers appear everywhere in nature, in the proportion of our bodies, in the way that sunflowers organize there seeds, in the way branches grow on a tree and the way leafs grow on the branches, in the way eagles fly towards their preys - everywhere. The Fibonacci numbers are the closest we've got to mathematicly understand the laws by wich our world is created. It's a quite personal album. I like my music to be somewhat documentary. Almost all songs are based on an improvisation, and then digital editing and overdubbing, arranging and more overdubbing and more editing. Most of the snippets origin from my mp3-player, with wich I've recorded stuff that happend and places I've visit. They make a mosaique, that sums up my life during the time I made the songs. And there is a few sampels, a little from the tv show "This is our music", one from the movie "Harrold and Maude" ,..., and of course Sture Dahlstrom, one my favorite authors (who played jazz before he started writing). He goes: "I haven't tuch my guitar for 40 years now, guess I wanna know if there's still some music in me." I was really into Fibonaccis numbers at the time, it's a beautiful sequence. And I just liked the idea of a record with 89 tracks. And I needed something to arrange my music around. The number sequence did it."